Concrete plays a vital part In our daily lives, with immense benefits to so.ciety when building s,chools, hospitals, apartment blocks, bridges, tunnels, dams, sewerage systems, pavements, runways, roads and more. It is the world’s most widely-used man-made material, with around ltpa used for each inhabitant. This amount is twice as large as the total of all other building materials, including wood, steel, plastic and aluminium,none of which can replace concrete in terms of versatility,longevity, effectiveness, price and performance for most purposes. 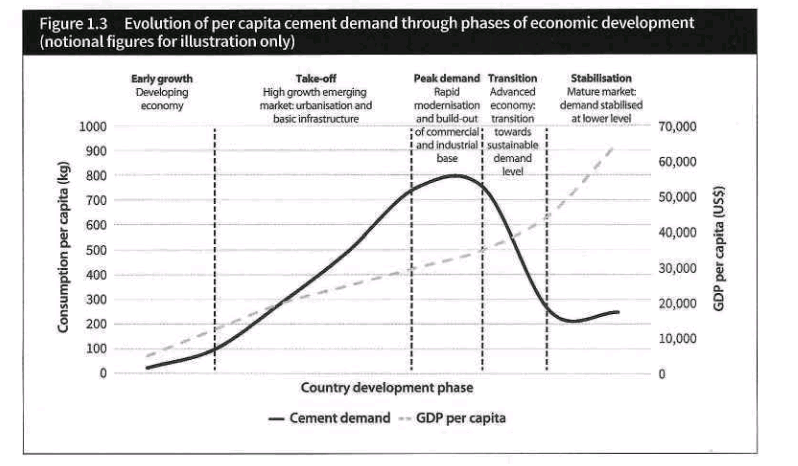 Cement is essential for many feature:; of modern liJe and Table 1.1shows a long-term growth r(!te in cement demand of2-3 percent per year, accelerating to a little underfourpercent for the decade upto 2000 (Portland Bill,2001). 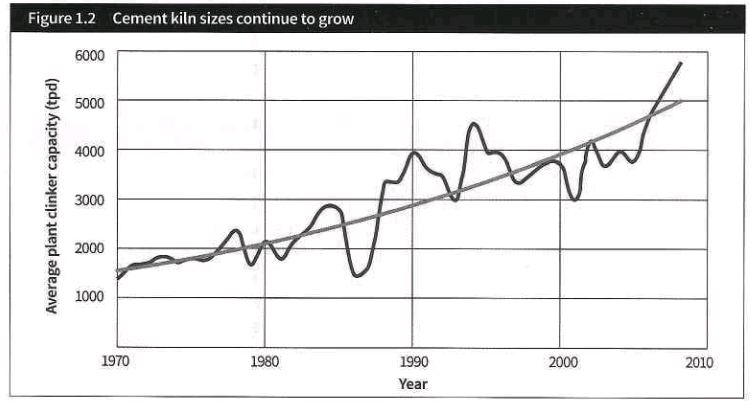 Consumption subsequently increased by over seven per cent annua lly from 2000 to 2011,reaching 3585Mt,then easing_to around four per cent to reach4056Mt in 2015 (Armstrong et al,2017) .Subsequent annual growth forecasts are relatively low and variable,strongly influenced by expectations for the Chinese market.The estimated total for world cement and clinker trade in 2016 was 189Mt (ibid). The size of a typica lmodern cement plant has grown considerably ,as illustrated bythe trend of orders fulfilled by FLSmidth (Kristensen, 2009} (see Figure 1.2). More recently,this trends towards higher kiln sizes has been maintained,though at a slower rates,with capacities over 6000tpd commonly installed in the more populous countries, including India,Pakistan and Indonesia. Until the more widespread acquisition of lower-cost equipment from China and India in recent years, the cosr of a greenfield plant was typically above US$180m/ Mta of capatity, equivalent to around three yea rs of turnover, ranking cement manufacture among the most capital-intensive Even with more Asian components, costs remain around the US$l00m level. Producing 1t cement requires fuel equivalent60 -130kg of oil and.some llOkWh of electric power. Cement hasa low value-to-weight ratio, limiting the distance that cement canbe economically transported, before the cost of transport exceeds the cost of the product. For land transportatio n, the maximum economic haul distance is nearer to 200km than 300km. Maritime transportation for over 4000km with 35,000t car.go can be as cheap as 300km oftruck transport. 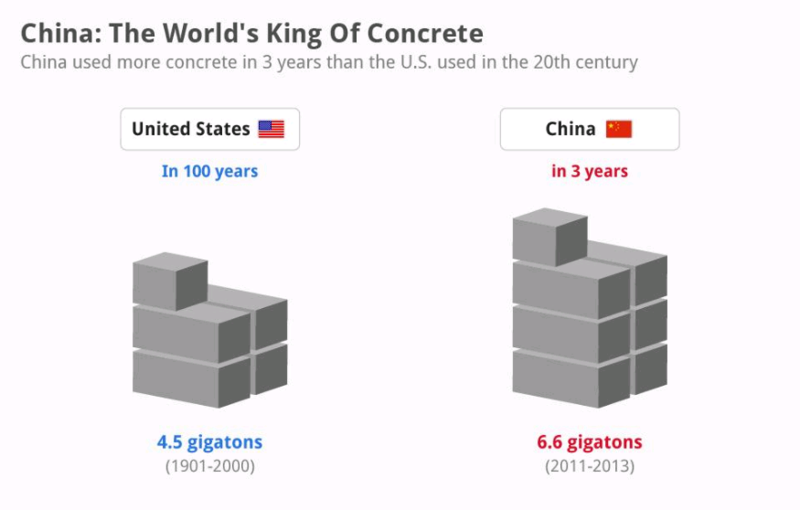 Demographic trends, including population age,growth rate and urbanisation, are the main drivers of cement consumption. The pace of growth of demand is influenced by a country’s stage of economic development and wealth, often measured by GOP per capita. The world average of per capita c ment.consumption in 2016 was 560kg, while the median- which is perhaps-a better indicator of central tendency,as it’s less affected by outliers- reached 285kg. The conventional wisdom has long been that, as GOP per capitiil increases, so does a nation’s cement consumption, until a plateau is reached at around US$1.5,000 GOP per capita (eg, Bert , 2003).ln reality, the relationship between GOP and cement consumption is more complex, with data showing -a wide variation of trends, but clearing indicating a decline in consumption at high levels of G’DP per capita as well as variation in regional trends. development, as.they lack the capacity to invest in public infrastructure and housing. As a country develops it moves into a phase of higher economic growth, enabling the population to invest in housing and basic infrastructure. As per capita income increases further and a nation movestowards a higher incomestatus, it continues to build up its infrastructure alongside its industrial and commercial base,’thereby maintaining a high level of consumption. country will have satisfied much of its development and housing needs. A single new kiln may produce 13,000tpd of clinker, to be ground with other materials to produce over lS,OOOtpd of cement. This involves the quarrying or purchasing of over 24,000tpd of raw materials (includingnon-clinker cement components) -and their blending,homogenlsatlon and milling, plus the processing of about 2000tpd of fuel, and the milling and dispatch of the product. All of these materials h.ave to be stored, extracted from storage, transported and fed to·equipment at a controlled rate -and this isnotto mention the hightemperaturesthatare employed and process exhaust gases to betreated!